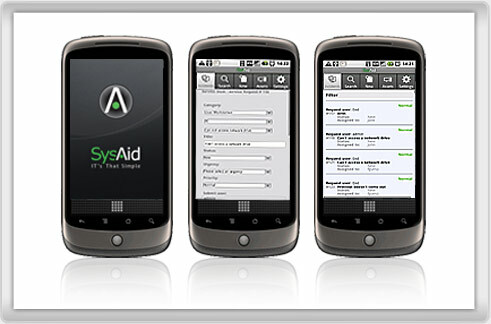 SysAid Help Desk App for Android is Now Available! Poll: How Do You Name Your Servers? Every IT department has its own unique set of demands, and from my conversations with SysAiders over the years, I've learned that there are many definitions of "IT success." For some, a track record of 99.99% availability is the standard of excellence; for others, maintaining tight control over assets and inventory is the biggest achievement. This month's newsletter focuses on an aspect of IT success that is equally important: providing high-quality support to your end-users. With the release of 7.0, you can now ensure that you provide speedy and excellent service with the new SLA management module. While many in the industry assume that SLAs are primarily for large organizations, organizations of all sizes can in fact benefit from implementing and measuring service standards. SysAid Director of Product Management Oded Moshe discusses this very subject in an article that was featured as a top headline in leading IT publication TechRepublic entitled "SLA management is important in small companies, too." In case you missed it, read the article and learn how SLA management can help organizations of all sizes achieve increased efficiency and higher quality service! Even without SLA management, SysAid makes it easy to provide better service with its core help desk functionalities: due dates, routing rules, automatic notifications, priorities ... automating your processes and keeping your end-users informed is the key to IT success! 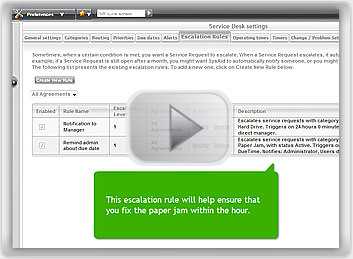 With this month's tutorial and tip, you can learn how to get the most out of due dates and escalation rules to improve your service quality with minimal effort. Last but not least, this September is your chance to register for the October SysAid Certification Program! To see how you can benefit from the SysAid Certification Program, read this month's IT success story in which Jeannette Berman shares how the course helped her successfully implement SysAid! SysAid Director of Product Management Explains Why on TechRepublic! Ever wondered why small companies might need SLA management? Never knew that your IT department is actually a lot like a bakery? If you happened to visit the TechRepublic website a few weeks ago - the leading IT trade publication and social networking site for IT pros - you might have seen a top headline that read "SLA and SLA Management are Important in Small Companies, too." This featured article was written by no other than SysAid Director of Product Management, Oded Moshe! The item has generated buzz among industry experts and the news media with its explanation of how all organizations - regardless of size or structure - can benefit from SLA management. In case you missed the article on TechRepublic, read the first few paragraphs below for fascinating insights into how SLA management can help all IT departments provide better service and improve efficiency. When a customer walks into a bakery and asks for a buttered roll and a large cup of coffee with cream and sugar, the expectation is that within a few minutes, the person behind the counter will respond with a small white bag and a cup with a lid on it. In the bag, the customer will expect to find a sliced roll with butter. In the cup, the expectation is that the coffee contains the right combination of sugar, cream, and water. With much larger bakeries, such as Panera Bread, the process is more systematized. The corporate parent outlines how much milk and how much sugar is added to coffee. And a measured amount of butter is added to the roll, so that the overall company can operate more efficiently. But for a "mom-and-pop" bakery, there are fewer, if any, processes. In the IT world, the situation is similar, at least concerning the issue of Service Level Agreements (SLA) and Service Level Management. Most, if not all, large enterprises have SLA/SLA Management in place. From the CEO down to the receptionist and from servers to laptops, the IT department is clear on what the priorities are, how much time they have to service particular ticket-types, and when they have failed to abide by the SLA. And more and more, IT SLA/SLA Management is seen as strategic to a company's operations. After all, the more efficient IT servicing is, the more efficient the company will be as well. So even for managers as high as the CIO level, SLA/SLA Management is given significant attention, as it will impact the overall performance of the company. However, for smaller companies, it's less likely that any form of SLA/SLA Management will be in place. So why is this the case when it seems that there is no downside to a company being equipped with SLA? After all, SLA is designed to make the company more efficient in how it handles any issues that may arise concerning IT. And SLA Management helps the company understand whether the priorities it has put in place are correct and whether the company is benefiting as a result. Why should smaller companies implement SLA? Read the rest of the article to find out! Jeannette Berman Got a Clearer Vision of SysAid - and Even Liked the Homework! The ninth round of the SysAid Certification Program starts on October 4, 2010! Hundreds of SysAiders who graduated from the course now have the tools they need to get more out of SysAid on a daily basis for real results and better IT performance. You don't have to be a SysAid veteran to benefit from the SysAid Certification Program; many recent participants have in fact been newcomers who've used the course for successful SysAid implementation! Jeannette Berman, Help Desk Associate at ClearVision Optical, had never used SysAid before she took the SysAid Certification Program. "I had used a help desk system I had created on SharePoint at my previous job, and I wanted to learn the ins-and-outs of SysAid so that I could manage it more effectively. I also wanted to see what ClearVision may not have been using that could make us more efficient." With daily responsibilities that include answering phone calls, responding to emails, and responding to service requests, Jeannette needs to have ready access to information to be able to get answers quickly and easily. With the SysAid Certification Program, Jeannette has been able to tweak SysAid to suit her unique requirements and make it more efficient. "If you have not used SysAid before, the SysAid Certification Program is a great resource to get you acclimated to the way it works. The information I need is now at my fingertips. While we still have some work to do, the foundation of skills I got from the course are what helped us get this far. I know most people won't say this, but the homework really helped!" Whether you've been using SysAid for years or installed it just a few days ago, the SysAid Certification Program is your chance to learn strategies and techniques to help you work more efficiently and productively. Register now for the October 2010 course and gain the tools you need to get the most out of SysAid! We're happy to announce that SysAid Helpdesk App is now available for Android! It was posted in the Android Market just yesterday and within the first few hours of its release, almost 50 people already had it downloaded and installed! Giving you the flexibility you need to respond to service requests and manage your assets directly from your Android device, SysAid Helpdesk App is also key to improving your service quality. With anytime, anywhere access to your help desk, you can respond to service requests faster than ever and provide your end-users with the quick support they need. To get SysAid Helpdesk App for your Android now, visit the Android Market directly from your handset. Create service requests as new, change the status, priority, due date, and urgency of a service request, view a complete list of your assets, update asset information ... all from your Android! IT has never been so simple! Better Customer Service Software for Your Organization! We're happy to announce that this month, a new release for our customer service and support product, SysAid CSS, will be available! Just as SysAid IT helps your IT department provide better internal support to your end-users, SysAid CSS helps customer support desks provide superior service, increase customer satisfaction, and retain a loyal customer base. This new release includes new features and functionalities that will help customer support departments work more efficiently and provide a better service experience to customers. For more information about SysAid CSS, visit www.sysaidcss.com - this is your chance to help your colleagues find better customer service software! Just as IT's that simple with SysAid, SysAid CSS makes providing excellent customer support easy and efficient. While SLA Management is a powerful and important tool for companies of all sizes, providing better service quality doesn't necessarily require the immediate configuration and implementation of service level agreements. This tutorial shows you how to create due dates and escalation rules to resolve service requests with speed and efficiency and keep your end-users informed about the status of their service requests. By automating your help desk processes, improving service quality is easy! Want to learn how to get more about SysAid's other features? Check out the other videos in our product tutorial series! For internal service providers, commitment to high-quality support requires work and attention every single day. With SysAid, due dates are a key player in the commitment to high-quality service, and your ability to meet your due dates is extremely important. To ensure that you meet your due dates, you need to monitor them. SysAid offers many wonderful ways for you to monitor your due dates - add "due dates" as a column in your help desk list; run reports on your due dates - but this month I want to share a different angle with you: the Service Request Matrix. The Matrix screen can be customized to show different information for your specific needs, but I think that that it's very important to know how to add due dates to the matrix. That way you can monitor the distribution of service requests according to which are before the due dates and which are past the due dates. When you step into the office and view the matrix, you'll be able to instantly see which service requests need to be immediately addressed. To add due dates to your Matrix view, you need to add filters to the Help Desk list. This configuration should be based on your database, so click here to get instructions per database on how to customize the matrix view. 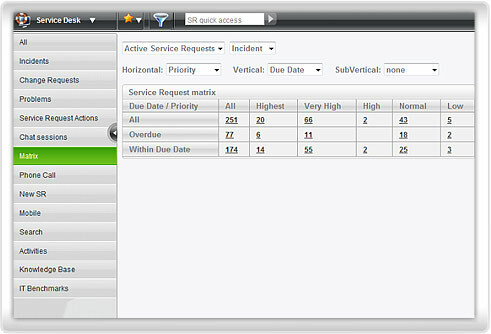 Customizing this view is just one way that you can fulfill your commitment to your end-users and provide better service! How Do You Name Your Servers? With the migration to 3 new servers last month, the IT team here at SysAid was confronted with a task as challenging as the migration: what to name the servers? Our admins were generous enough to get us all involved, so we went the democratic way and voted according to what we thought sounded "cool." In other organizations, however, the practical aspects of IT win over and servers are named according to their functionality. Should the naming of servers be an art or a science? Is server migration not the time to get creative? After its functionality, after your favorite TV character, after planets in the solar system ... How Do You Name Your Servers? Last month we asked "What's the best vacation destination for an IT pro?" and the responses were evenly divided. Whatever your choice or destination, we hope you had a fantastic holiday!